Jamie joined Inshes Vets in May 2015. He graduated from Glasgow Vet School and then worked in a mixed practice in Knaresborough in North Yorkshire for two and a half years. 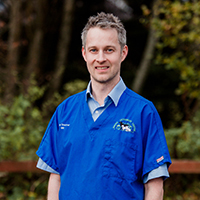 Jamie also did locum work in Australia for a year, before returning to the UK, where he went to Birmingham to work in the PDSA Animal Hospital. He now lives in Inverness.